After you’ve chosen and resized an image to use on your website, you might want to add a caption to enhance it. Except for titles and headlines, captions (also called cutlines) are the most-read piece of copy within a publication. Many believe that a picture is worth a thousand words, and photos can definitely help increase the interest level of your content. Not only is it important to write a caption that quickly captures the essence of the content, you may want to consider that by leaving the space under the photo blank, you miss an opportunity to convey critical, interesting, and helpful information. If you choose to include an image on your website, it’s helpful to understand how the audience may interpret that photo. The reader typically gives the image a quick glance, mentally capturing the basic, visual data first. Less obvious elements of the photo may not register at that moment. Following an initial look, the reader is likely to read the caption below the photo if the image provoked a reaction or captured his interest. He looks at the caption to explain more about the photo, so you want your caption to do a good job providing that explanation. 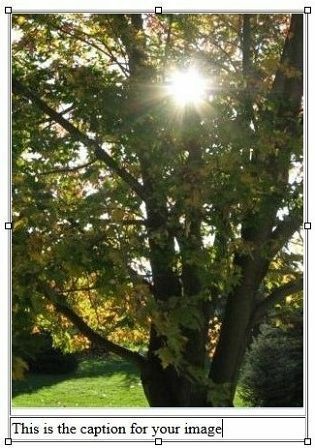 The reader will likely then look back at the photo after absorbing the caption information. The caption should help the reader understand the photo. It should supply critical information that the picture doesn’t give. The caption should be as short as possible. A brief, exact statement with a critical piece of information is perfect. Overview: When you use DSS to add a caption to an image, it helps to line up the caption and image using the table feature. This allows you to center the caption text beneath the photo or align it in the exact position you want. Be sure that you’ve resized the image before you begin. If you need help with resizing, read through our instructions on this process. Step 3: Under the Rich Content Editor, click the Table icon. This icon is designated by a picture of six small squares. If you mouse over the icon, the word “Table” displays. 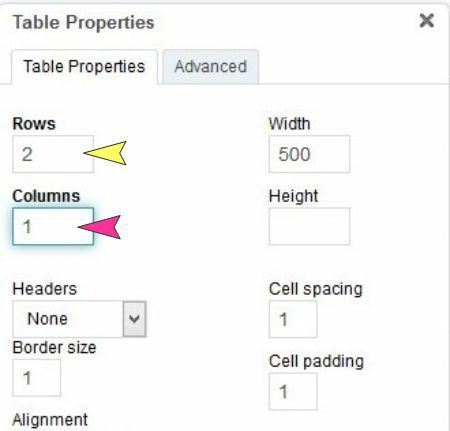 Step 4: In the Tables Properties dialog box, enter 2 for Rows and 1 for Columns. This creates two empty cells, one on top of the other. Step 5. 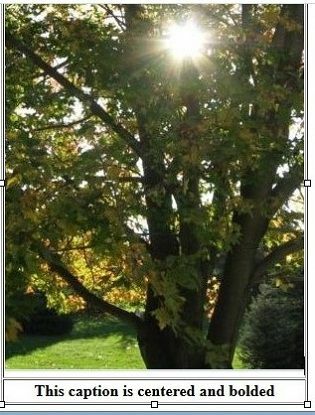 Insert the image you want to be displayed on the website into the top cell, and type the text for your caption in the bottom cell. Tip: You can center or align the text and add any desired styling—bold, italicize, or change the font. However, don’t give the caption a header tag (H2, H3, H4, etc.). Step 5: Click the orange SAVE button. Step 6: Click the link to the right of PAGE URL. This takes you to your website, and you can view the image live on the page.